There has been a lot written about GDPR, especially in light of Cambridge Analytica. This post from Doc Searls stands out for its depth, especially in regards to his references and resources. 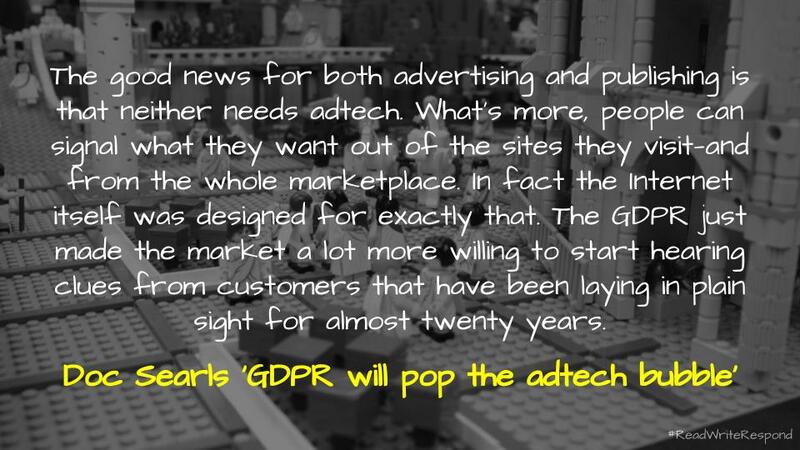 He discusses what he sees as the eminent demise of ‘adtech’, technology such as analytics designed to support advertising. I love when advertisements can take on double meanings. In light of the actions in South Africa, not sure Australia has real openers right now either. Google, Facebook hidden trackers follow users around the web at alarming rates, says DuckDuckGo's CEO Gabriel Weinberg. To make any real progress in advancing data privacy this year, we have to start doing something about them. Not doing so would be like trying to lose weight without changing your diet. Simply ineffective.